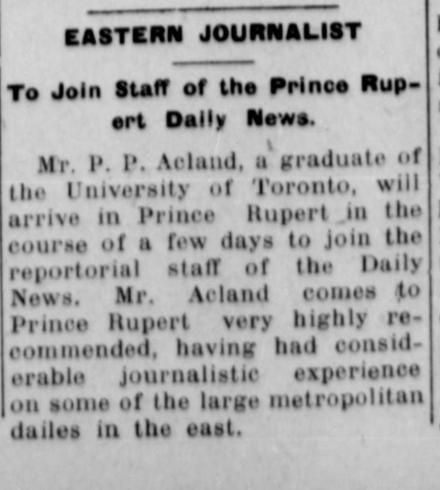 In May 1913, having recently graduated from the University of Toronto, Peregrine Acland took the train to Vancouver and boarded the steamer Prince George for the northern British Columbia port town of Prince Rupert, where he joined the “reportorial staff” of the Daily News. 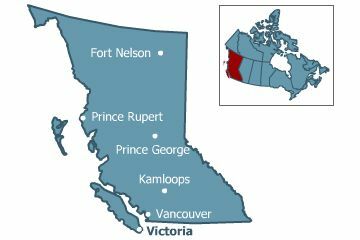 Acland’s tenure in Prince Rupert was short: he arrived on June 4th, 1913 and left on September 3rd, 1913. The Daily News is a typical example of a small-town newspaper from the period. Published six days a week, each edition runs to four pages, with some local editorial comment, news and notices, but with much of the content picked-up from wire-services (or the 1913 equivalent). Unfortunately, none of the articles indicate authorship, so it is impossible to determine just what Acland wrote for the Daily News. There are some general points of interest, but the archive of the newspaper is perhaps most useful for establishing firm dates in Acland’s chronology, demonstrating an instance or two where he exaggerated certain details of his time in Prince Rupert, and shining a very brief light on one or two incidents in All Else is Folly. Peregrine Acland’s name appears in the paper a total of nine times between May 30th, 1913 and December 30th, 1916. The first four instances detail his appointment to the Daily News, his arrival and his exit. 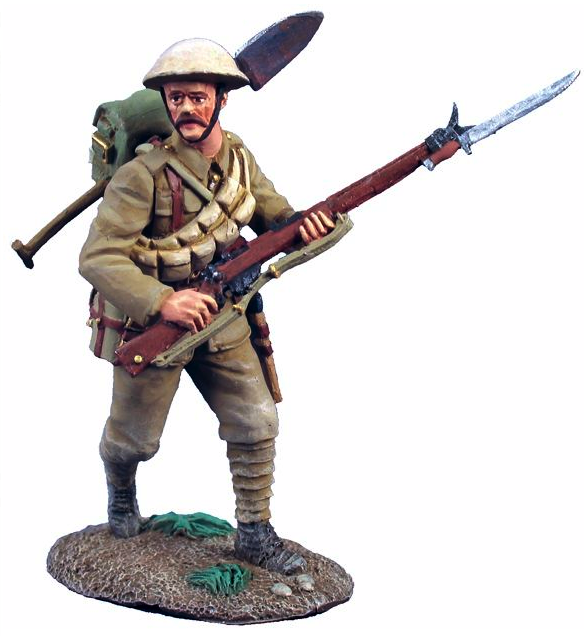 The final five entries mention his articles for other publications and the details of his injuries on the Western Front. Photo: The Daily News, Prince Rupert. Friday May 30th, 1913. Vol. IV, No. 126. Page 1. Photo: The Daily News, Prince Rupert. Wednesday June 4th, 1913. Vol. IV, No. 130. Page 4. Acland is also listed on the ship’s manifest of arrivals in Prince Rupert on June 4th, though his name is misspelled as “P. Ackland.” As an aside, Peregrine Acland’s is a frustrating name to search for, despite its distinctiveness. He occasionally appears as “P.P. Acland,” “P. Ackland,” “Perry Acland” or sometimes just as “Perry.” Something to keep in mind if you’re trawling through the letters of Duncan Campbell Scott or the diaries of W.L. Mackenzie King. I’ve read every issue of the Daily News from 1913. It is charming and occasionally shocking to read a small-town newspaper from nearly a hundred years ago. There is earnest editorial discussion about the merits of ‘taxing single men’ to encourage them to marry, news stories about men sentenced to ‘six months hard labour’ for selling booze to Indians, and a minor scandal about a prominent local man who was seen leaving a drinking establishment well after closing time. The Horror! One editorial was aghast at the sum of $200,000 that had recently been paid for a Rembrandt at auction in Paris. The Daily News was a Liberal newspaper, and boasted they had the largest circulation in Northern British Columbia. The major stories of summer of 1913 were the Mexican civil war and the United States’ potential for being drawn into the conflict after Wilson’s refusal to acknowledge the Huerta government, as well as the ongoing struggles in the Balkans. Domestically, Conservative Prime Minister Robert Borden’s naval policy elicited many scornful editorials. My favourite, from August 6th, 1913, begins: “For a year or more now Premier Borden has been dreaming of an emergency which may overwhelm the British Empire in fury and disaster.” If only they had known what was on the horizon. The actions of the Minister of Militia, Sam Hughes, also appeared with relative frequency in the summer of ’13, and were treated with similarly dismissive editorials. Even when Hughes visited Prince Rupert on June 26th, 1913 to announce funds for a new armoury, the Daily News could not help but point to the lavishness of Hughes’ entourage and the three rail cars he occupied as he crossed the country. The most frequent news stories throughout 1913 concerned “militant suffragettes.” Many stories from Great Britain and America dealing with these ‘harpies’ were reprinted in the Daily News, the more sensational the more prominently placed on the front page. Clearly it was a major issue of the period, and of particular concern to what was undoubtedly a conservative, resource-based, secluded, northern town. Rarely a day went by without some mention of suffragettes in the Daily News. Acland’s final weeks at the paper saw a minor scandal erupt with the town’s mayor, and later Premier of British Columbia, Duff Pattullo. The hounding of the mayor by the Daily News would lead to Pattullo being tossed from office later that year after Acland returned to Ontario. Three distinctive trends appear in the paper during Acland’s time at the Daily News. First, there is far more literary comment and news than either before his time there or after. Though I cannot positively attribute this, or any of the trends to Acland’s influence, it seems likely. 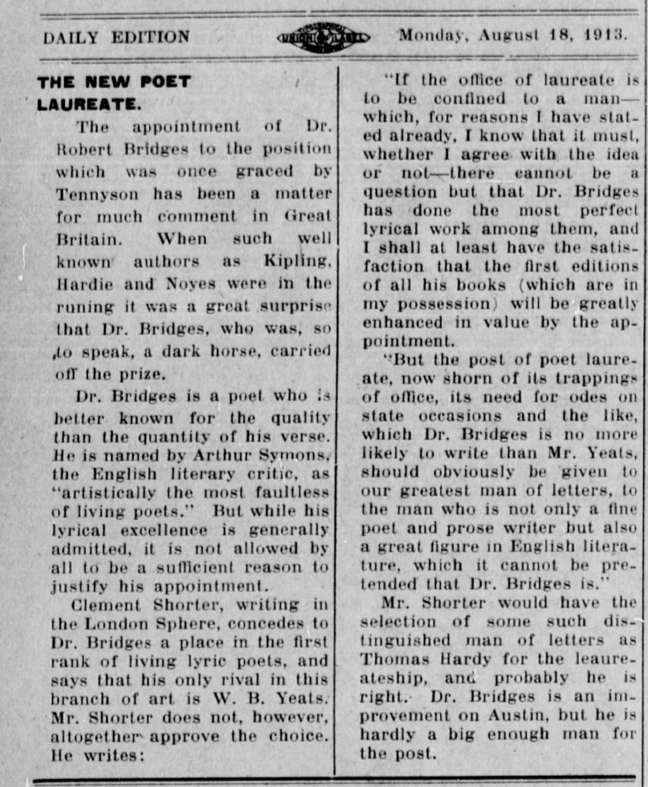 There were passing references to Upton Sinclair, the marriage of Robert Service (June 25th), Alfred Noyes being the likely (and worthy) successor to the post of poet laureate (June 14th), notice of Dr. Robert Bridges being appointed laureate on July 23rd, the complete text of Kipling’s poem Song of the Widow on August 25th (a reference to Queen Victoria which is speculated cost him the laureateship), the appearance of a Robert Burns manuscript (August 30th), the discovery of General Wolfe’s copy Gray’s Elegy Written in a Country Church Yard, as well as other passing remarks to writers now long forgotten: Thomas Nelson Page, for example. Photo: The Daily News, Prince Rupert. Monday August 18th, 1913. Page 2. This section of the newspaper was dedicated to the daily editorial comment, which in tandem with the subject matter, leads me to believe that it was written by Acland. The second and third trends that appear in the Daily News during Acland’s time have to do with the layout and appearance of the paper. Particularly in August, the paper beings to look very clear and clean, almost modern, with vertical lines running between the columns, making it very easy to read. The layout before his time can best be described as haphazard, with little one-inch-square articles placed randomly in any available space. Acland also appeared to bring a flair for advertising with him to the Daily News, as his arrival coincides with the appearance of ads for major national brands. Previously, advertising in the Daily News was confined to the local merchants, with the occasional Vancouver based store; with Acland came ads for Gillette, Budweiser, Baby’s Own Soap, Guinness, and near daily ads for the Canadian Advertising Agency, which extolled the virtues of advertising generally. This trend is mildly interesting considering Acland’s later work at J.W.T. Advertising in the 1930’s and Day, Duke & Tarleton in the late 1940’s. Finally, the paper began carrying many more ‘society’ pictures during Acland’s tenure. Famous socialites, Royalty, sports stars and prominent persons all became a regular fixture on page 3 in the summer of ’13. Several of the people included were known to Acland, or later would be: W.L. Mackenzie King, Sir Robert Falconer, & people associated with the 48th Highlanders. (I’ll post these later when I deal with his war service & writing). Furthermore, the Daily News also began publishing pictures of ‘the latest fashions’ –typically elegant ladies from Paris, New York London and Toronto. They also began running a second comic strip, a single pane editorial-style cartoon to round out the general frivolity of page 3. I think that’s enough for one post. I’ll pick up this thread again in part II. This entry was posted in Uncategorized and tagged Advertising, Daily News, Peregrine Acland, Prince Rupert. Bookmark the permalink.